It's a relatively small plant. Roughly less than half a foot tall. Tips are real sharp and pointy, needle like. Green thick waxy type leaves are edged in white which turn into white threads about half way up the leaf that hang off the edges and curl a bit. The bottom half on the edges of the leaves are not edged in white and have a very small toothy edging. New growth seems to grow from the middle. Hi Alyssa, this looks to me to be Yucca filamentosa, or Adams Needle. Filamentosa means 'thread like' which is exactly what the plant has on the edges of the leaves. There seems to be a heated debate going on about this plant; some people love it for it's reliability and ability to thrive in extremely tough conditions. Others hate it because it can be invasive, readily self seeding after it blooms, and it's got really sharp leaves. Whether you love it or hate it, it's good to have a hardy and tough plant if you've got the room; these can create a clump of the needle like foliage a few feet across, or much less if you keep it confined in a pot. You can see more about this plant on Dave's Garden Website. That is very interesting...I must say the yucca filamentosa is the closest I've seen to looking like this plant. Though to me the leaves look different. It's hard to say but the yucca looks more like it has blade like leaves, is that right? 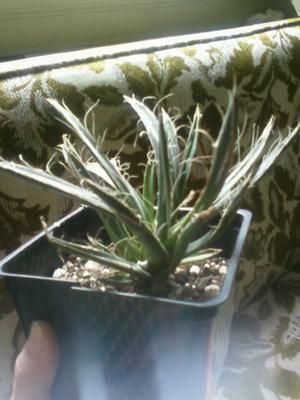 To me my plant looks as if they are more like an aloe(being thick and fleshy) but with much tougher skin. Also the inside of the leaves have a sort of concave to them as if a bit has been scooped out. you know what...you totally got me on a roll with the whole yucca filmentosa, looking that up actually led be to some interesting pics. that's making me think that it's possibly a thread agave but the exact variety of it I'm not so sure? Alyssa, I'm glad I could get you on the right track, even though it started out wrong! Good persistence on your part has made it all work out.